Snapdeal has come up with huge discount on Titan watches. It is not easy to find huge discount on titan watches in online shopping sites like Flipkart, Amazon, Snapdeal and Shopclues. Rarely we get huge offers on titan watches. 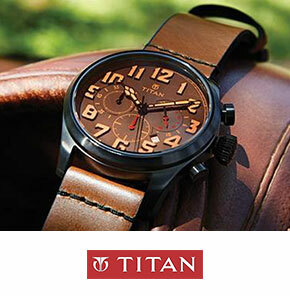 Many Titan watches are available in huge discount like 30%, 40%, 50% and 60% in Snapdeal. Hurry up to avail this offer. How to buy titan watches in huge discounted price in Snapdeal? 1. Visit Titan watch offer page here. 2. Browse and select the watch you would like to buy. 3. Click on Buy Now to buy. Make payment and buy or avail COD. Avail some other interesting offers on your titan watch purchase from Snapdeal. You can get 10% cashback if you use HDFC Debit and credit cards on Snapdeal App. Snapdeal HDFC Promo code - HDFCBANK. Pay online and get coupon codes worth Rs.500 on a minimum purchase of Rs.500.